It's time to get your dancing shoes out! 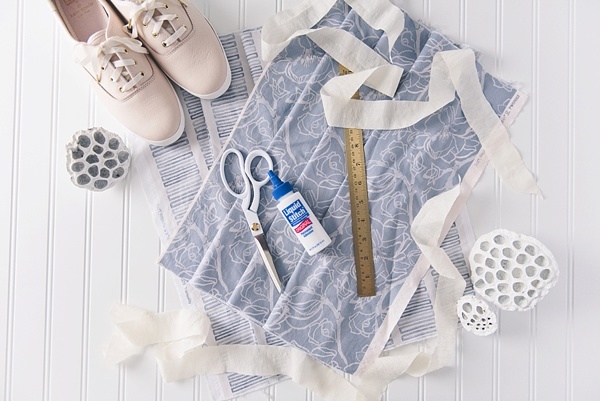 Inspired by the pretty and practical, we are kicking up some cool moves by sharing our latest DIY project created in partnership with our friends at Keds! 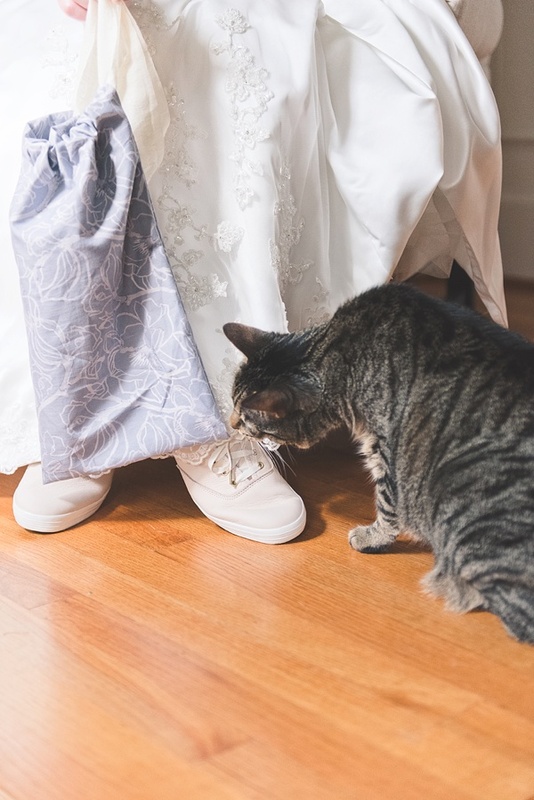 We know stylish comfort is everything on a wedding day when you’re on your feet for six or more hours, so with Keds' diverse wedding collection of leather, glitter, and floral patterns, we’re officially obsessed. (Past Tidewater and Tulle couples have also thought the same for their own Keds-included celebrations!) 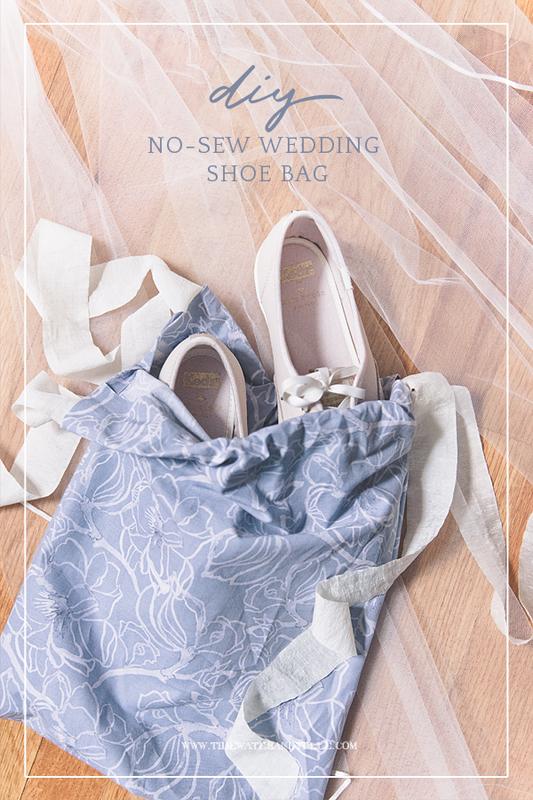 And all those gorgeous sneakers should have an equally gorgeous shoe bag to tote around on the big day! These super easy cotton shoe bags can be made without sewing knowledge and can be personalized in any way depending on your wedding theme. The best part? Have your wedding party over one weekend and make it a big crafternoon so everyone gets in on the handmade fun! 1. 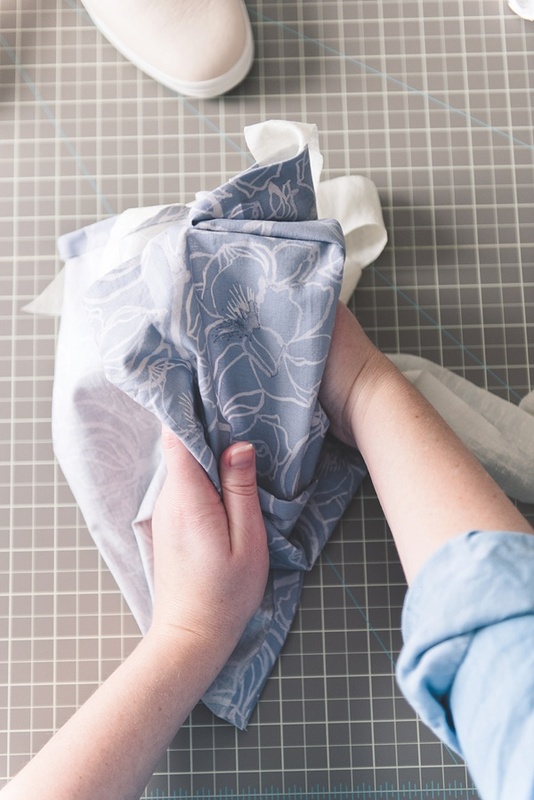 Before you begin, you will need to prewash all fabric, dry, and then iron. 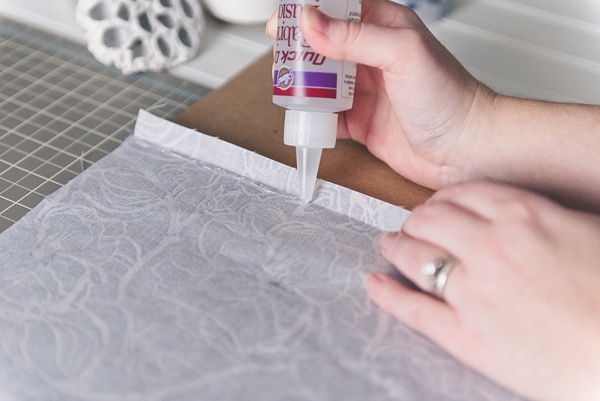 This helps set the permanent fabric glue you’ll be using for your shoe bag. 2. Fold fabric in half (like how it was originally cut from the store) and measure 14" across and 16" down. Using the ruler and grid guide on the cutting mat, cut fabric according to measurements. Helpful Tip: Depending on your shoe size, you may need to adjust your width and length measurements accordingly. 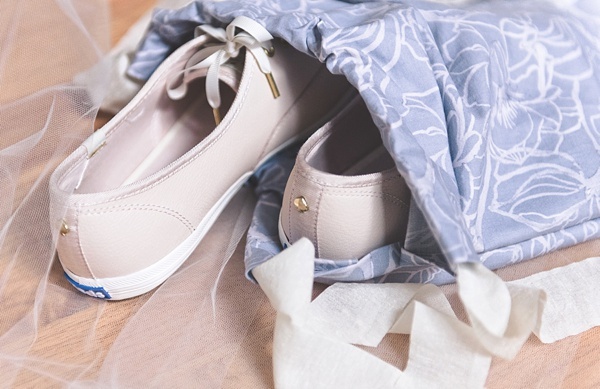 For creating this DIY, we used a women’s size 8 1/2 Keds x Kate Spade New York pair of leather sneakers to ensure plenty of room in the bag that could include socks or other small wedding day accessories. 3. Flip fabric so that the backside is on the outside. You will mostly be working "inside out" for the entire project. 4. 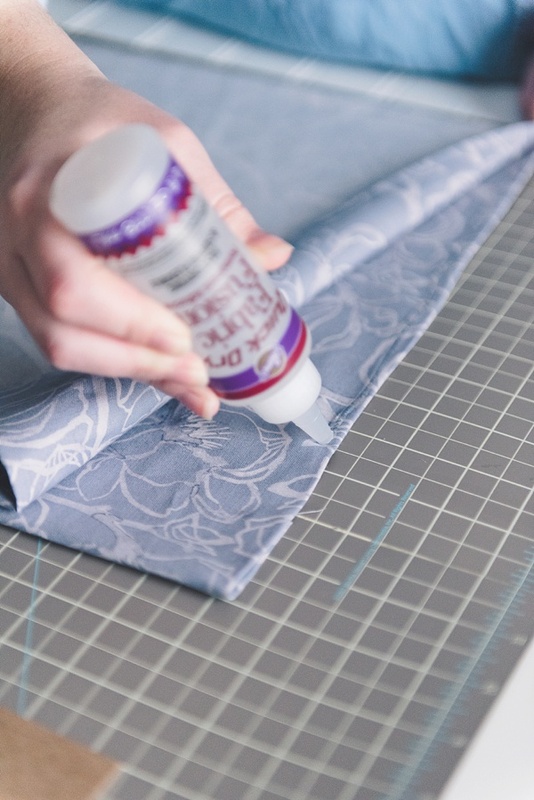 To create a finished seam look for your ribbon section and inside of the bag, cut two small slits of about 1/2" at the bottom of the bag to make four flaps (two on each side). Use your iron to flatten all four flaps and to create a firm crease. After the fabric is set, draw a glue line underneath each flap. Let dry. 5. 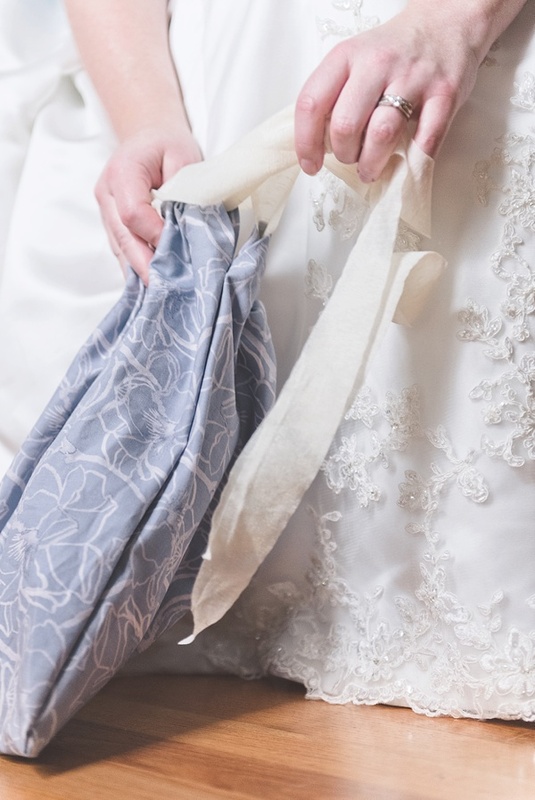 To create the section where your ribbon will be pulled through, fold about 3" of the fabric on one side from the top of your bag and draw a line of glue at the edge. Repeat with the other side. Let dry. Helpful Tip: Use your ribbon as a visual marker to see how wide it is and how it will fit in the drawstring area by placing it across your bag. Adjust measurements accordingly. Our ribbon was 1 1/2" wide. 6. Your bag should still look inside out with the backside facing up. Now it's time to close up the bag! On the printed side underneath your flaps, draw a line of glue on the left and right sides up until you get to the ribbon section. Do not glue the top part of the bag or the ribbon section. Let dry completely according to your glue's drying time. 7. Once everything is dry, use a ruler to help thread your ribbon through the top section. 8. 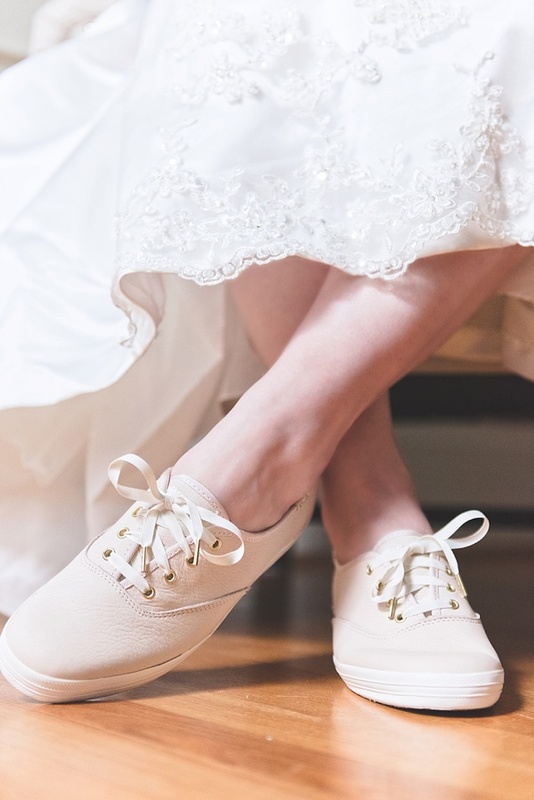 Turn your bag inside out and slide in your celebration kicks from Keds for a super chic to carry and protect your stylish footwear to the wedding! 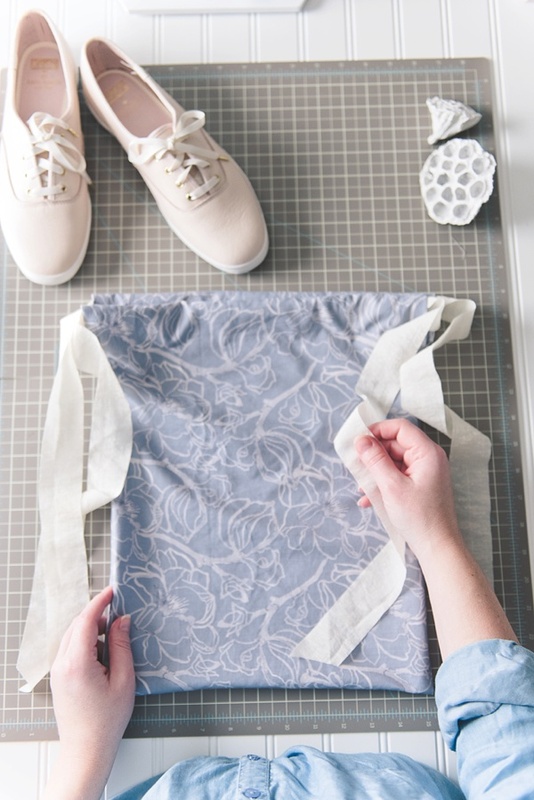 Since your new DIY shoe bag is completely washable and doubles as a dust bag when your shoes are not in use, let’s chat about keeping your shoes in picture perfect condition after you’ve been dancing all night. For leather shoes, like our Keds, you will only want to spot wash and air dry only. There are cleaning kits you can use like this one Keds offers for their sneakers, but sometimes all you might need is a little water to wipe off any dirt. Sealed leather is a favorite because of its durability and chic look! For satin heels, it’s all about dabbing cold water on the stains with a cloth. For tougher stains, you can use a tiny amount of lathered hand soap on your washcloth and dab only on the dirty spots. After dabbing with the soap, make sure you dab with clean cold water afterwards as the soap can stain the satin. It’s also important to not put any soap on non-dirty spots or you risk ruining the fabric! For sequined or glittered footwear (because who wouldn’t want some sparkle), it’s another spot wash situation due to the delicate nature of this glittery look. While high quality, glitter naturally loses its shine after extensive wear over time, so it’s a must to keep these in a shoe bag to keep them protected from closet happenings. 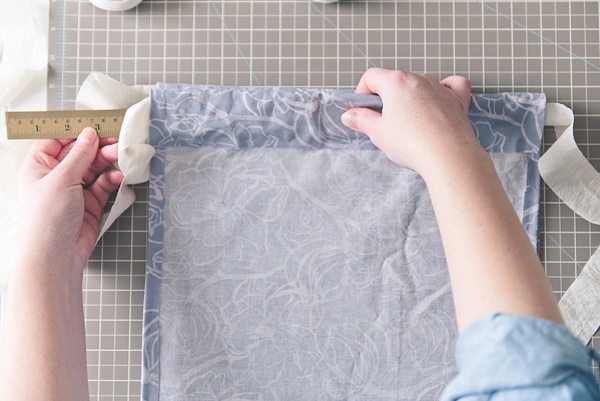 Many thanks to Keds for partnering with Tidewater and Tulle for this DIY tutorial feature! And while the disclaimer is that we were sponsored through compensation to write and design this, the words and our loyal love for the Keds brand are all our own. Some of the above product links are affiliate-linked and purchasing through these links helps support our wonderful sponsors and Tidewater and Tulle! You can find our full affiliate disclosure policy here. Love Comfy Bridal Shoes, Too? Shop Our Other Curated Favorites!